Say Ni Hao (Hello) to the Ni Hao companion site! 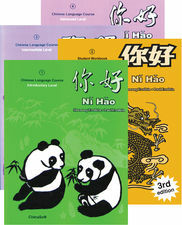 This four-volume series is a basic course for students of Chinese. Available in both simplified and traditional characters, Ni Hao introduces Chinese language and culture and builds communication skills in both spoken and written Chinese. ChinaSoft, the Australia-based publisher of Ni Hao's simplified character editions, has created an online forum for teachers using the Ni Hao series. All teachers worldwide are welcome to join. Visit http://www.chinasoft.com.au/teacher.html and join today!